Sleep mode, once known as Stand By or Suspend mode, is an energy-saving way to not quite turn the PC off. In Sleep mode, Windows Vista saves what you’re doing and then puts the computer into a special low-power mode. The computer isn’t exactly off, and it restores itself quickly, which makes Sleep mode more effective as a way to shut down the computer. 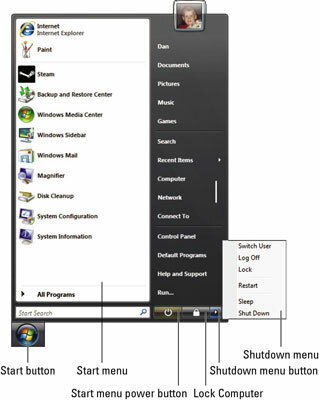 To put your PC to sleep, choose the Sleep command from the Shutdown menu. Choose the Sleep command from the Shutdown menu. You can also program the Start button menu’s Power button to put the computer to sleep. Sleep mode is controlled in the Power Options window, which you can get to from the Windows Control Panel: Either open the Power Options button directly in Classic view, or from the Control Panel Home, choose System and Maintenance and then Power Options.